It was the first time hunting together for some of us. Others have hunted for years together. The tip for success was scouting early and often. We worked well together hunting in groups, while others who had success would do some scouting during the hunt and try to put some birds to roost. 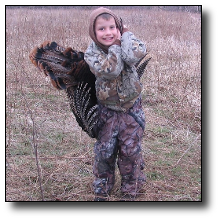 My son Joe was able to get his bird during the Missouri youth season. He is seven years old. I had scouted this farm several times and knew there were birds on it even though I had only caught glimpses of them on my scouting trips. I made a special trip Friday before youth season to try and put some to bed. At seven years old, I figured his attention would die off quick after daylight, so I wanted him to be in the birds early. I was surprised at where they were roosted and had to make an adjustment to my original plan. We were set up with a big tom within 50 yards of us on Saturday, but as usual they flew off and headed to parts unknown. With no gobbling once they were on the ground we went to plan B and C and ended up calling it a day at lunch time. I was amazed he was into it that long. I found out once we got home that he had a blister the size of a nickel on his heel. We decided to set up a ground blind before we left that Saturday where the birds pitched down that morning and figured we would be in it at daylight on Sunday. If all went well we would be set for a quick hunt and be back in town in time for Church. Of course we did not mark the blind on the GPS and with me carrying him on my shoulders, (because of his blister) by the time we finally found it we were spooking birds off the roost! The good news was that they were in the same area again the bad news was we were spooking them off to early. As daylight approached, the toms were gobbling all around us, but nothing close. After fly down time I started talking to a hen in the field. Trying to keep her close-by, a tom gobbled less than one hundred yards from us. He answered a couple times then shut up. My past hunting experiences told me he was on his way. Well, that was the case but we were not done yet. The bird slipped in behind us and spooked at the blind. He flew up in a tree not 60 yards behind us. After 20 minutes sitting there inspecting the area he gobbled on his own. Figuring I might still have a shot I called back to him. He answered but stayed on the limb for another ten to fifteen minutes. When he decided to pitch down well I think I could have grabbed him from the blind. It took us a little time to get my son on him, he finally asked me to let him move the gun himself. Once he was on him I made a soft yelp and the bird picked his head up and looked right into the blind. At that point it was too late, he let the 20 gauge roar and the bird never knew what hit him! The following weekend was Easter and I took my whole family to meet with three other HSP members in Kansas. Andrew and I had gone out earlier to scout a few of these farms and the whole clan arrived in time to scout Thursday afternoon. We roosted several groups of birds, so the plan was to double team them to improve our odds. This almost worked to perfection, as we had one group of birds working in our direction, but due to a Hen spooking, only two birds were taken off of that set up. Wanting to let those birds rest we decided to hit some walk in areas as well as see if there were any birds on other sections of HSP property that we had to hunt. It did not take long and we found a lone strutting tom in a field. Some quick decisions on how to access him and we were off again. Slipping up an old creek bank to get close, a couple calls, a full strut decoy deployed, "and this bird was running to us." When the shot rang out the bird was less than 10 yards from us. I was holding onto the decoy. Back at the cabin we met with rest of the group and made a game plan for the afternoon. I was going to take my video gear to try and get some birds on tape. Well my aunt wanted to go so I backed out and spent some quality time with my wife and kids. As it got closer to dark I went out and tried to roost some birds for the morning, but then I got a call from my mom to come and pick her up. She had tagged out off the farmer we were staying on, could not believe it. Five birds taken on Friday, and still a day and a half to go! We were off to a great start! I went to Video my dad and another HSP member on Saturday. They set up under a bunch of birds that just decided they did not want to work. So after fly down we had to do some maneuvering just to try and get into a spot where they were heading. I stayed behind and let him go. After an hour or so he was on his way back with a couple of birds. With some poor weather coming in, the rest of the hunt was really slow. 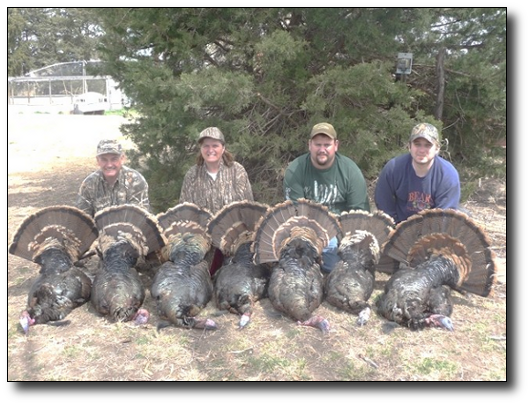 "But five hunters, seven birds, in two and a half days, made for an awesome Easter weekend."